I’ve been working on a graphic that helps me to visualize how traffic flows to a web site. I’ve used the software industry as the basis for this but it could easily be translated to any industry. I’m posting this in hopes of getting some feedback as I’m sure I’m missing some things and would love to hear people’s opinions. 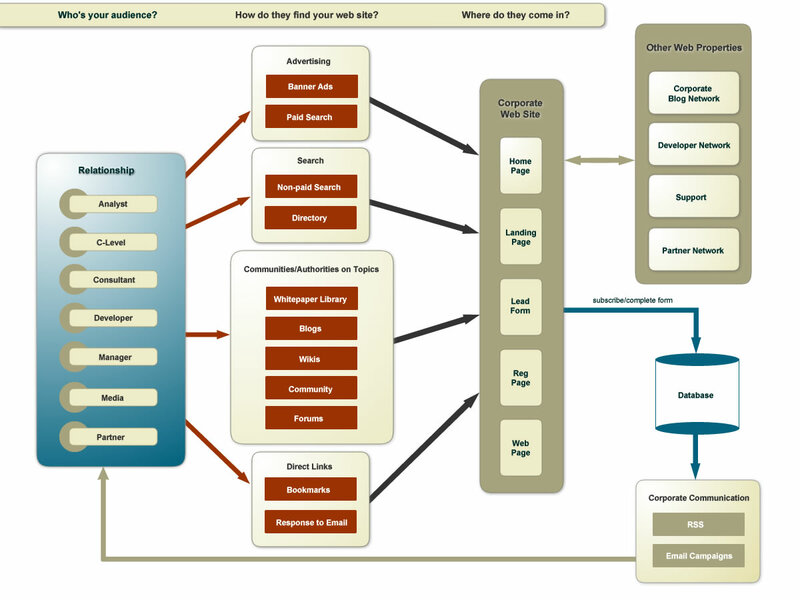 I’ve found that looking at this diagram has helped me think about how each audience would get to a web site and the types of questions they’d be asking. I’m also working on a series of diagrams that breaks each audience segment into a work flow outlining the questions they’d be asking what information they’d be looking for. I’ll post these at a later time once they’re completed. I need your help to find my next job! I know I’m asking for a lot and there’s probably only a handful of companies in the world that fit into this criteria, let alone within 30 minutes of my house, but I’m going to go big and then take it from there. So what would you get from me in return? Thanks to everyone whose taken the time to read this far. I appreciate your help! Please feel free to comment or email me any related information.